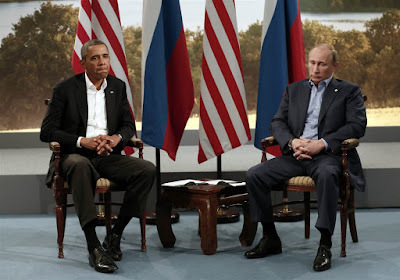 WASHINGTON/MOSCOW -- U.S. President Barack Obama and Russian President Vladimir Putin will meet in New York on Monday at a time of high tension in Europe and the Middle East, but the Kremlin and the White House disagreed on Thursday over the top priority for the talks. President Barack Obama meets with Russian President Vladimir Putin during the G8 Summit at Lough Erne in Enniskillen, Northern Ireland, on June 17, 2013. The White House insisted the meeting would focus on eastern Ukraine, where Russian-backed forces are fighting the Kiev government, prompting tough sanctions that have damaged Russia's economy. Moscow said the main focus would be on Syria, where Russia has built up its military forces in recent weeks with combat aircraft, tanks and other equipment in support of President Bashar al-Assad. Putin's spokesman, Dmitry Peskov, told reporters: "Of course, the primary topic will be Syria." Asked whether Ukraine would be discussed, he said: "Well, if time allows." "There will be time," Obama's spokesman, Josh Earnest, retorted during a briefing in Washington. Earnest, speaking at the White House, played down the possibility for any "major announcement" from the meeting. Obama and Putin will hold a bilateral meeting on Monday afternoon during the three-day session of the U.N. General Assembly in New York, the White House said. White House officials said Obama would push Putin to explain how his country's military presence in Syria will contribute to the defeat of Islamic State. The two camps also differed over who called for the meeting. The Kremlin said it was organized "by mutual agreement," but Earnest said it was being held at Putin's request. He said the Russians were "more desperate" to talk to their American counterparts because of the economic sanctions' impact. Past meetings between the two leaders have been frosty. One encounter in June 2013, which also focused on Syria, resulted in a famous photo of the leaders looking distant and glum. Earnest said Putin had used similar body language in a photo after a meeting with Israeli Prime Minister Benjamin Netanyahu this week. The United States also hopes to advance political talks on Syria at other General Assembly meetings, Sheba Crocker, assistant secretary for international organization affairs, told a State Department briefing. But Crocker said the United States would not back a U.N. Security Council statement on countering terrorism proposed by Russia because of fears it would send the wrong message to U.S. partners in the fight against Islamic State militants in Syria.